Bennet tore into Sen. Ted Cruz, R-Texas, ahead of the votes, blaming Cruz and other Republicans for the ongoing shutdown over a wall and border security measures he put into his Gang of Eight comprehensive immigration bill in 2013, which passed the Senate at the time with 68 votes and was never brought up in the Republican-led House. 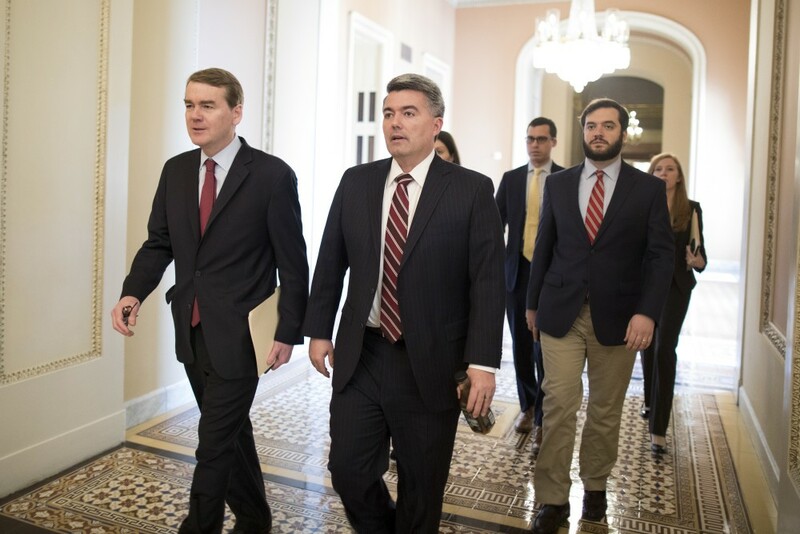 DENVER – Two votes to reopen portions of the federal government held in the U.S. Senate Thursday failed , as Colorado’s Republican Sen. Cory Gardner voted for both and Democratic Sen. Michael Bennet supported only the “clean” measure backed by Democrats that did not contain the president’s sought-after $5.7 billion in border wall funding. Both measures – one backed by Trump and most Republicans that included the wall money and another that was a clean two-week funding bill backed by Democrats that already passed the House – needed 60 votes to pass the Senate, and neither got 60. The Trump plan failed in a 50-47 vote , while the Democrats’ measure failed in a 51-47 vote. Sen. Joe Manchin, D-W.V., was the lone Democrat to vote in favor of the wall measure, while six Republicans joined Democrats in voting for the clean bill, including Gardner. Gardner has said for weeks he doesn’t think the government should be shut down while border security negotiations are ongoing. With the partial government shutdown on its 34td day Thursday, Gardner pledged before the votes to support both. “I’ve consistently been against government shutdowns because I don’t think they are the right way to govern,” Gardner said in a statement before blaming Democrats for the shutdown that President Trump said he would own. “It’s disappointing Senate Democrats are refusing to support the President’s reasonable compromise that would open the government, fund border security, and protect Dreamers. I will continue to work with a bipartisan group of Senators to find a compromise that opens the government and funds border security,” Gardner added. Bennet, meanwhile, tore into Sen. Ted Cruz , R-Texas, ahead of the votes, blaming Cruz and other Republicans for the ongoing shutdown over a wall and border security measures he put into his Gang of Eight comprehensive immigration bill in 2013 , which passed the Senate at the time with 68 votes and was never brought up in the Republican-led House. Bennet and Gardner also worked together on several immigration bills in 2017 and 2018 that had some of the same things that the president is asking for now. Bennet was referring to the floods that ravaged Colorado in September 2013 and left the state recovering during a government shutdown that lasted from Oct. 1-17 and was encouraged by Cruz and other conservatives in an attempt to delay the implementation of funding for the Affordable Care Act. Bennet then took after Republicans who have dug their heels in on the president’s latest demand for $5.7 billion in wall money while the shutdown continues. Among other things in a 20-minute speech , Bennet railed against the House Freedom Caucus, which he said had “completely distorted” the Republican party in Congress, and against the increasing deficits, which he blamed on Republican actions. Though the two votes failed, senators were discussing other options to try and end the shutdown shortly after the votes. But in his speech, Bennet pleaded to end the shutdown for the sake of federal workers. White House Press Secretary Sarah Sanders said Thursday afternoon: "The President would consider a CR only if it includes a down payment on the wall." And documents reviewed by CNN on Thursday showed the White House was preparing a draft proclamation to declare a national emergency along the border and that the administration had identified more than $7 billion in possible funds. 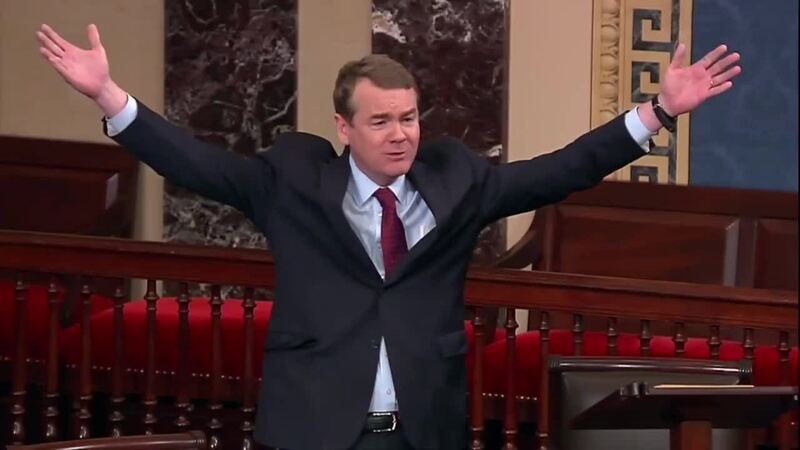 Bennet told NBC's Chuck Todd Thursday afternoon that he had "no idea" what a down payment would mean. "It's not like there's a bunch of clarity that comes out of there," he added.